Article: NapakTilas; commemorating Sukarno A little rain couldn’t stop one man from walking the streets of Bulelengto raise awareness for a good cause.People in the Lovina area took notice of the little man with the bright eyes, making his way from west to east, talking to people and taking a rest now and then. His name is Sakirman and he is walking in the footsteps of first President Sukarno to commemorate his spirit and the early days of the Republic when people shared the exciting promise of a prosperous future and a righteous nation. 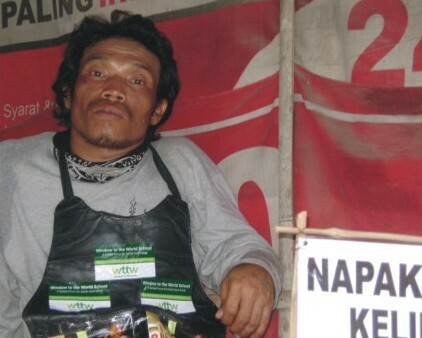 At the age of 39, Sakirman, put on his walking shoes and started to walk the country from point one, as Sabang is often referred to, with the aim of crossing the country on foot – a solo tour. He calls himself an ordinary person and his heart beats for his beloved country and also cries for it, as he explains to people. He says I will cross the country from west to east, from Sabang to Merauke. In doing this I would like to commemorate our founding father, Bung Karno, who also travelled to draw attention to his cause in those days. I started walking in December 2014 and I arrived in Bali exactly one year after my departure. I walk because I feel our nation has lost the spirit it was once built on. There is corruption now and people tend to work for their own causes rather than our nation’s needs. I would like to send out a moral wake call to the people I meet along the way. I talk about our founding father and his concerns for our nation and I ask what people are doing today to continue his ideals. We ask Sakirman how he prepared for his travels and how he finds the people responding to his message. I did not prepare, I just made a plan and started walking. I only have the clothes I am wearing and I buy a new pair of sandals every week. I have met friendly people and I also have been robbed. Sometimes I have fun, sometimes I am lonely. Occasionally, I can make money and I sometimes get fed. Here in Lovina I am walking for the Window to the World School, since I met with the people behind it and their story inspired me. We wish Sakirman good luck with his NapakTilas challenge. He still has got a long way ahead of him but with his spirit he will surely accomplish his mission. Greet him when you meet him, or invite him to join you for coffee together. For sure he will be very happy to explain why he is where he is on that day!